It’s official. 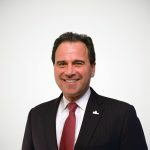 After eight years of having the second-highest corporate tax rate among industrialized countries, the United States has now assumed the top spot following Japan’s scheduled corporate rate cut on April 1, 2012. Since 2001, Japan had levied the highest combined corporate tax rate among OECD nations at 39.5 percent, slightly higher than the 39.2 percent combined federal-state rate in the U.S. Japan’s new rate is 38.01 percent, which includes a temporary 10 percent surtax that will expire after 2014. The attention given to the Japanese rate cut has overshadowed the fact that Great Britain also cut their corporate tax rate on April 1st from 26 percent to 24 percent, and will cut the rate again to 23 percent in 2013. Moreover, on January 1st of this year, Canada cut its federal corporate tax rate from 16.5 percent to 15 percent. Canada’s combined rate is about 26 percent when the average rate of the Canadian provinces is added to their federal rate. But the race toward lower corporate tax rates extends well beyond the larger economies. According to Paying Taxes 2012, published by the World Bank and PricewaterhouseCoopers, there have been 133 major corporate tax cuts globally since 2006. Indeed, between 2006 and 2010 alone, more than 75 countries cut their corporate tax rates – some more than once. The nearby chart illustrates how the U.S. has fallen behind in the global tax race simply by standing still. 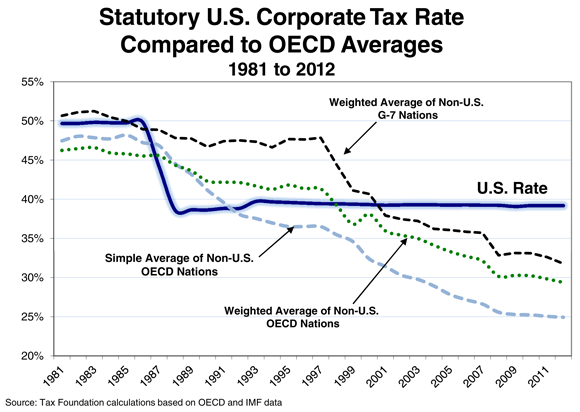 Indeed, 2012 marks the 21st year in which the U.S. corporate tax rate has been above the simple average of OECD nations. Even if we account for country sizes, the weighted average of OECD nations fell below the U.S. rate in 1998 and been getting lower ever since. Skeptics will point out that the OECD averages are being dragged down by the low rates of smaller nations such as Ireland, Poland, and Slovakia. However, the chart also shows clearly that the average of the larger Group of Seven (or G-7) nations has also been falling – especially driven by the dramatic rate cuts instituted by Canada and Great Britain. Taking the recent Canadian, British, and Japanese rate cuts into account, the weighted average of the G-7 nations is now below 32 percent – three percentage points lower than the federal U.S. rate alone and seven points below the combined U.S. rate. The table below lists the current corporate tax rates of the 34 OECD nations and their ranking as of April 1st. Ireland has the lowest rate of 12.5 percent, while four nations (the Czech Republic, Hungary, Poland, and the Slovak Republic) share the next lowest rate of 19 percent. Five nations (Chile, Greece, Iceland, Slovenia, and Turkey) all levy a corporate tax rate of 20 percent. The table also takes a ten-year snapshot comparing the current rates with the rates imposed by each country in 2002. The tiny 0.1 percentage point reduction in the U.S. rate is entirely the result of reduction in various state rates over the past ten years. Of the 33 non-U.S. OECD nations, 28 cut their corporate rate during the past ten years while two had no change. Meanwhile, three countries (Chile, Hungary, and Iceland) increased their rates over the same period. However, all of these nations have rates that are 20 percent or below. The country that cut its rate the most over the ten year period was Greece, by 15 percentage points, from 35 percent to 20 percent. Turkey had the next largest rate cut of 13 percentage points (from 33 percent to 20 percent) followed by Canada, the Czech Republic, and Israel which each cut their rates by 12 percentage points. Many will discount the importance of the U.S.’s high statutory corporate tax rate by saying that because of “loopholes” in the tax code, our effective tax rate is much lower. However, Tax Foundation economists have shown that even after accounting for tax deductions, the U.S. effective tax rate is still remains one of the highest among industrialized nations. The scheduled rate cut on April 1, 2012 lowered the federal rate from 30 percent to 25.5 percent. Including the sub-national rates, Japan’s overall “normal” rate is 35.6 percent. However, the temporary surtax adds another 2.37 percentage points to the overall rate for 2012, 2013, and 2014 tax years. In 2015 and beyond, the combined rate in Japan will return to 35.64 percent. The G-7 nations include: Canada, France, Germany, Great Britain, Italy, Japan, and the U.S.
 See: Philip Dittmer, “U.S. Corporations Suffer High Effective Tax Rates by International Standards,” Tax Foundation Special Report No. 195, September 2011, and William McBride, “Beyond the Headlines: What Do Corporations Pay in Income Tax?,” Tax Foundation Special Report No. 194, September 2011.